I’m enamored with writers’ spaces, and I love to see the different things other writers surround themselves with to be productive and inspired. 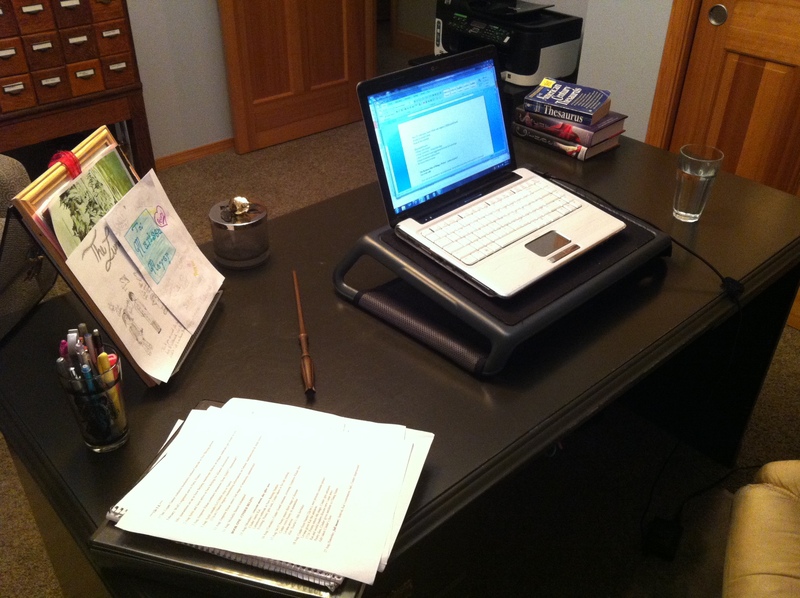 So today I thought I would give a little tour around my writing desk (where I sometimes actually write!). 1. My laptop! (Obviously…) And, lately, the little stand to keep it more at eye level, even though I think it puts a greater strain on my wrists. But hey, ergonomics is a tricky thing. 2. Pens and highlighters. I’m forever refilling this little cup—I don’t know what it is about pens that makes them disappear all the time! 3. My writing calendar (that’s the three-ring binder on the bottom of the stack). I’m frequently scheduling events or Skype visits or checking deadlines, so this binder is never far from reach. 4. A spiral notebook. I jot notes to myself all the time—things to remember for the next book, or a line to add in a previous chapter, or don’t forget to do a search and replace for “shoulders” because holy cow my characters shrug a lot. I find it easier to switch to paper for these little notes than to switch between computer files. 5. 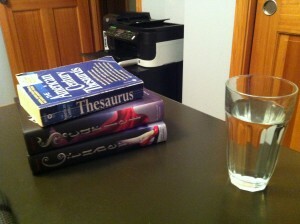 A thesaurus. Stephen King once said that any word you need to look up in a thesaurus is the wrong word. Ignore him. I use mine all the time. 6. Cinder and Scarlet. I’m constantly checking things that happened in the previous books to make sure the series stays consistent. 7. A beverage. Usually water, but sometimes coffee or wine. 9. A scented candle. I don’t burn it all the time, but sometimes you just need a little extra something to get in the writing mood. 10. My wand from the Wizarding World of Harry Potter. I’d like to say that looking at it fills me with inspiration and dedication to my craft because J.K. Rowling is such a friggin’ genius, but mostly I just like to twirl it around when I’m stuck, or attempt to cast “do something interesting” spells on my characters. 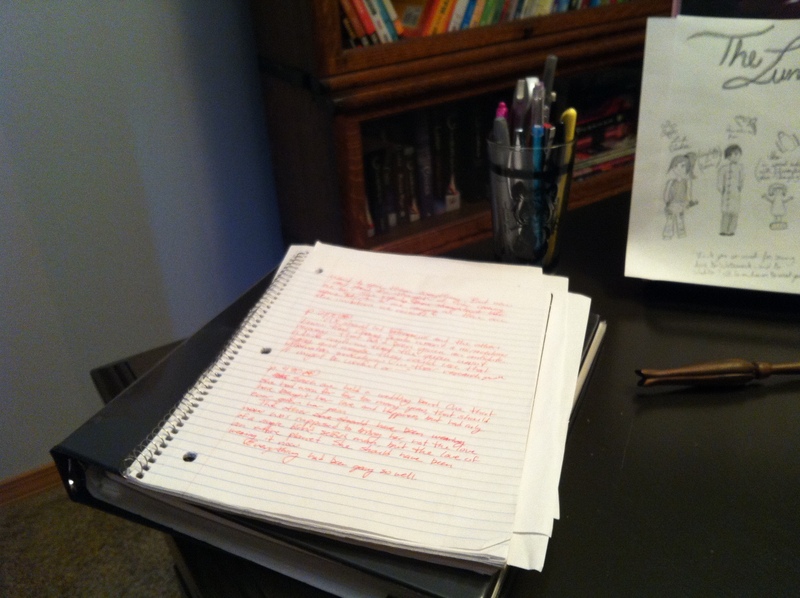 And that’s a peek into my little writing world. What do you keep in your space? Haha, love the wand! My desk is filled with library books, a bunch pens, notebook, and of course my laptop. The scented candle is a really good idea! Maybe it’ll help me get back into the writing groove…. Lol. 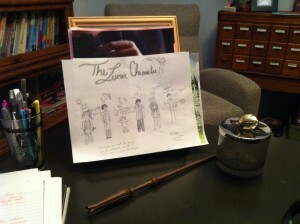 My writing space looks very similar to yours, except my fan art comes from my twelve-year-old daughter and I have Hermione’s wand. What I don’t have (besides two published books of my own) is the stand. Where did you get it, I could totally use one? I wish I had a magic wand to wave around, but when I’m stuck I usually end up spinning around in my chair and staring outside at the rain. My writing space is full of sticky notes. Which I use for everything. My desk is basically made of sticky notes. Marissa, your desk is so nice and clean, I love it! I especially love the notebook and what you write in it and the HP wand. I have a shelf to the side with all of my favorite books (Guess what? YOURS is at the top of the stack! ), all five of my notebooks to look back through and write stuff down, a whole bunch of highlighters (My favorite is the pink one that is like wax. High gliders, I think it’s called? <3), My laptop and…A cat. Always a cat. I hope things are going well with CRESS! Remember that you're an amazing writer, and you can do ANYTHING you set your mind to! Christine, I love that you have a wand too! They’re great to fidget with, right? The stand that the fanart is on came from Staples, the stand that I my laptop is on I think I got at Bed Bath & Beyond. LOVE everybody’s ideas of what to have on your desk! Sticky notes and a cat FTW. My writing desk is very cluttered because it’s very small. It has the computer, of course. A stack of mini-drawers to keep pens, pencils, note paper, miscellaneous stuff (my poor attempt to keep it UNcluttered). My iPod, a little portable speaker to listen to my iPod, and one or two of my smaller BJDs ’cause I like looking at them. I’d sit the Shadow King on there with me, but unfortunately I have a VERY small desk and he’s much too big to fit. Muy bonito tu escritorio, y ordenado y todo. ¿No lo habrás puesto así para la foto…?. Ja,ja. Por que el mio era un caos de papeles, no había quien encontrara nada. y digo era por que ya no tengo. ” en mi habitación no caben mas cosas “. Ahora me toca ir con el portátil al de mi hijas, que por cierto son igual de desordenadas que yo cuando tenia su edad. Lo bueno del portátil es que te lo puedes llevar por toda la casa. por cierto, tengo que conseguir un soporte de esos, me ha gustado. Gracias por enseñarnos donde escribes y por las horas que he disfrutado leyendo tus libros. My desk doesn’t actually have many writing things on it because all my notes, thesaurus and inspiration pics are contained within my precious laptop. What I DO have on my desk is said precious laptop, my headphones (cause theres no writing problem music can’t fix), a cup of pencils plus a ruler (but I use that more for drawing then writing), a collection of piggy banks (what? That’s not weird…), and a random stuff that there’s apparently no better place for like my dad’s camera, my DS, random pieces of paper and a pink rock. Oh, and there’s usually a glass of Gatorade cause I’m ALWAYS thirsty. And in my desk is a plethora of notebooks and folders filled with drawings and ideas from my childhood. BTW I agree with you on the thesaurus thing, without it I think my writing would get boring with the same words over and over; and I’m bad for forgetting words. My writing spot is usually my bed or sprawled out on the floor with my laptop on my lap. Sometimes I think I’d do better with a dedicated writing desk. Other times I’m not so sure. I actually just read Mindy Kaling’s book & she has a picture of her writing desk which is nicely designed (and which she never uses) and a picture of her sitting in bed, where she actually does her writing. On my desk: Laptop, dictionary, pottery bowl with pencils, framed photo, bookshelf hooked onto my desk- so cool! Also, three ring binder 2 filled note books 2 blank notebooks! making. But tto keep your car happy, you can pick a 6 in 1 Car Charger kit. merchandise without the stress of stocking inventory, packaging products or even shipping purchased products to customers.